This model has been discontinued. 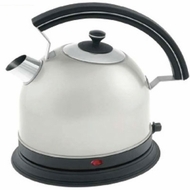 As an alternative, we recommend the Hamilton Beach 40886 Stainless Steel Kettle. Non-slip feet keeps the kettle in place during operation. Indicator lights for safe operation. Detachable base for cord-free convenience. Durable concealed stainless steel heating element maintains the purity of the water. Three level safety system - the unit will automatically shut itself off when: water begins to boil, kettle is lifted from base, kettle is empty. Removable, washable filter eliminates impurities and other deposits from water. Scratch-resistant exterior keeps the kettle looking like new!